As human beings, we all need to eat to survive.The foods we eat give us nutrients, mineral, and energy our body needs. But there are some foods you should never eat or eat as per dietary guidelines. And the consequences of these unhealthy diet elements shockingly impact our health. How many grams of sodium per day you should be taking. 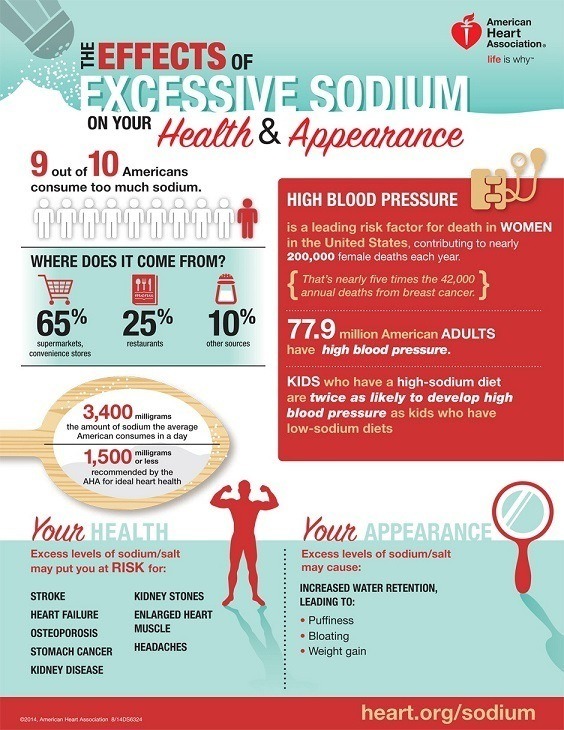 The World Health Organization(WHO) suggests sodium intake not to be more than 2g/day for adults. Does it mean restricting sodium consumption completely help even better? Definitely "NO'. Sodium is often referred as a nutrient villain. But, it also provides key benefits to a healthy and fit body like regulating blood pressure and blood volume. If a high intake is responsible for bad health, consuming it lower than recommended values is not suggested. Even the latest study by the McMaster University contradicts the popular belief of low sodium diet and reduced risks of CVD. Solid fats exist in the solid state at room temperature and have a high concentration of saturated and trans fats. The main source of solid fats is animal foods. Hydrogenation of vegetable oils is also a source of solid fats. Some of the easily available solid fats include coconut oil, palm oil, butter, cream and beef fat. How much of these fats should you be eating? 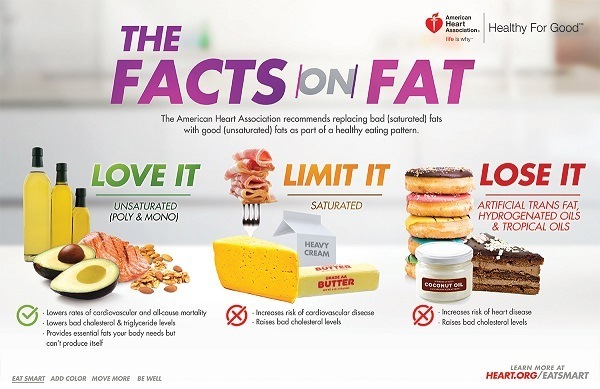 You can easily replace unhealthy fats WITH healthy fats if you track and control what you eat. What is added or refined sugar? This sugar is not natural but refined and added to your meal or beverage during preparation. Added sugar is not good for heart health and should be avoided. You can quit it or reduce its consumption by avoiding drinking more fruit juices and beverages loaded with added sugar. How many grams of sugar in a day you should be eating? It means if you eat a 2000 calories diet, then not more than 200 calories should come from sugar. A healthy or balanced diet has unsaturated fats, protein, carbohydrates, natural sugar, and salt. All in a healthy amount. Anything more or less is not good for your health. And, to get all these things in a healthy amount, eat fruits and vegetables, whole grains not refined grains, and avoid sugary beverages. Here are 6 foods that we all eat daily but they are not supposed to be good for health​. Fruits are good for a healthy diet because they have essential nutrients, vitamins, and minerals that we need. Fruit juices lack in dietary ﻿﻿fiber, an important part of your food that strengthens your digestive health, heart health, and helps you losing weight the best way. Dietary fiber also helps reduce chances of developing diabetes and some types of cancer. But, it is best to drink the fruit juices with moderation without added sugar. While they are lower in fat but they are rich in calories and also they lack the ability to make you feel full. So you always overeat them which makes you gain weight because of high calories. They have a high glycemic index and nothing good to add to your diet. They are advertised as being healthy because they are made from vegetables. The thing is the processing takes any real nutrients out. You are better off just eating real vegetables dipped in hummus. While true granola is good for you the granola bars are not.The bars are high in sugar and sodium and low in fiber. They end up being as bad as a candy bar. You can go a step further and change granola bars with chocolate, just have a real dark chocolate bar. Granola bars may cause a blood sugar spike, make you obese and will turn you unhealthy and unfit if you keep on digesting them in excess for a long time. Marketed to be healthier than high fructose corn syrup; the problem is it is actually much worse. While the fructose in fruits is fine for your health but eating things like agave and cane sugar will kill your metabolic health.This means your metabolism drops and has a harder chance of recovering.